Overtime is the realm of the weird in the NBA. Michael Jordan scored 69 against the Cavs in a single OT, it took two OTs for his historic 63 in the Boston Garden, and what has been referred to as “the greatest game ever played” between the Celtics and Suns at the 1976 Finals took three OTs before Boston finally pulled away. And after the Nets-Bucks went to war for three extra periods recently we can add Zaza Pachulia to the list of brain-scrambling beneficiaries of the triple OT. 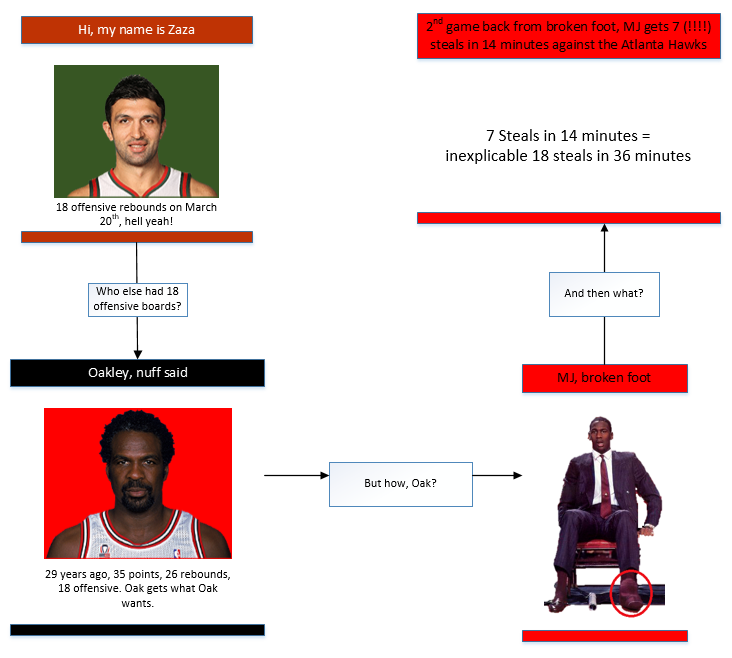 Pachulia, by some act of effort or opponent ineptitude, accumulated 18 offensive rebounds. The obviously rhetorical and trendy question is: Who does that? The literal answer is that since the 1985-86 season (which is the first season Basketball-Reference provides full box scores), just two other NBA players have achieved the Full Pachulia: eccentric friend of Kim Jong-Un, Dennis Rodman in 1992 and legendary tough guy Charles Oakley in 1986. For a sucker like me who’s prone to slipping and falling down rabbit holes with an Alice-like expertise, this was all too much to resist. Oakley’s game wasn’t just unique for the 18 offensive rebounds. Instead of resting on the laurels of setting a record, he mercilessly battered a Milwaukee Bucks frontline for 35 points, 26 rebounds, and seven assists with three steals for good measure. It was good enough for Oak’s career high points and second best rebound game. He grabbed 38% of his team’s own misses and 37% of all misses. Comparatively speaking, Zaza was at 37.7% OReb and Rodman was 38.5% — and the Worm also had a ho-hum 34 boards that night. The Oakley game took place in mid-March of 1986 when a young Michael Jordan was coming back from an early season broken foot and there at the bottom of the box score, playing just 13 minutes in a bench role was Jordan. A bit further digging revealed this was MJ’s first game back after sitting out the majority of the season. Maybe Oak was trying to let his running mate know he had his back or maybe he saw it as his one of his last chances to fire up shots without conscience (indeed, he never got close to the 27 field goal attempts he had that night) or maybe one of the Bucks had the audacity to challenge his Oakhood. Whatever the case, he was more attack-minded than any other game in his career.